Featuring self-powered illumination through Luminox Light Technology (LLT), this watch exhibits a new height in function. With tiny self-powered micro gas lights installed into the hands and hour markers, as used by the US Army, this timepiece tops them all. A screw-down crown (knob) creates a water-resistant seal. To unscrew the crown, turn counter-clockwise and pull/push into position to set time, date, and other functions. To close the crown, press it against the case and turn clockwise. The watch is said to be authentic , yet was shipped from Hong Kong ? Purchasing and dealing with folks on line was a huge hassle . People on the phone and follow up calls were a nice touch . 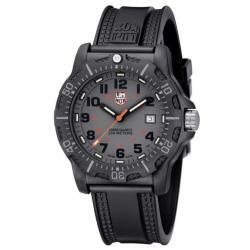 Does not come with Luminox warranty only a 1 year thing from wholesaler . Very courteous about returns , but also very mis leading . Do your home work before dealing with overstock . i have had this same watch for 3 years. I didn't realize I had a small crack in the crystal and did a fine job of filling it up w/ water in a whirlpool. I was upset. I shopped the Luminox line again and went back to the same model. Keeps great time, I can see it in the day and at night. As I get older my eyes get worse. I recommend this one to anyone! The rubber band on this watch is a joke. Where it connects to the watch assemble, it will fail within a year...I promise. I've been through two of those bands and they are hopelessly flawed. Finally, I found an after market band made of the same material as the case, and it is holding up. Luminox are nice watches, but shame of them for producing such a piece of crap band. Husband was very happy with this watch. This is the second Luminox I've bought for him and they stand up well to wear and tear. He uses this at work, home, vacation and it's been a great watch overall. I bought this watch for my husband for Christmas and he loves it! Durable as he is not easy on watches and comfortable for all day wear. The watch looks just the the photos, couldn’t be more pleased with this product. Easy to use...and very tough. Hands are visible day and night. Black with grey face is very pleasing. It's also a bargain. I bought this watch for my son and the first time it got wet, it couldn't take 3 feet of water never mind 200 meters. Didn't last a month. This was a replacement of an older watch of the same brand and was exactly what we expected. Very accurate and easy to read. I am quite satisfied. We have purchased Luminox products in the past and love being able to find them here at overstock.com. Great product! Many compliments!